Jordan will execute failed suicide bomber Sajida Al-Rishawi "within hours", as revenge for the ISIS killing of hostage pilot Moath al-Kasasbeh, a security official told AFP. Earlier, Jordan offered to swap the two prisoners. "The revenge will be as big as the calamity that has hit Jordan," army spokesman Colonel Mamdouh al Ameri said in a televised statement as cited by Reuters, after a video surface of the pilot being burned alive. A government spokesman promised a "strong, earth-shaking and decisive" response to the execution. King Abdullah II has cut short his visit to the US, while the country has declared three days of mourning for the "martyr and hero" al-Kasasbeh, who was taken hostage after his plane came down during a bombing raid on IS positions on December 24. In a statement, the monarch, who has ruled Jordan since 1999, called the immolation an act of "cowardly terror" and said that ISIS "had nothing in common with true Islam." Funeral prayers will be held in all mosques in the Middle Eastern state, and there have been reports of rambunctious demonstrations in Karak, the hometown of the slain pilot. Local media has reported that five jihadists, who are on death row, are being transferred to a prison south of the capital Amman, where executions take place. 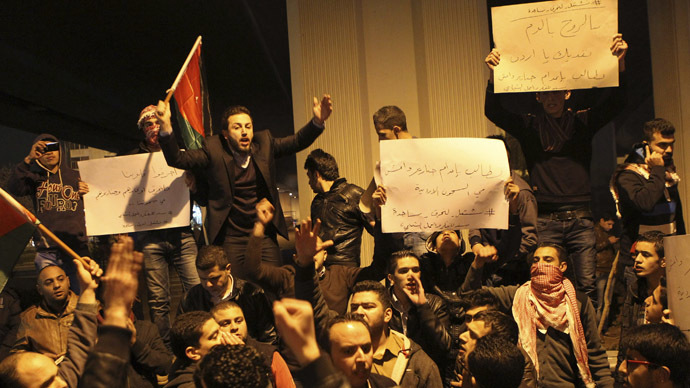 Earlier, Jordan threatened to execute Islamic State associates if al-Kasasbeh was not handed back alive. Al-Rishawi, who is considered a martyr by ISIS, unsuccessfully attempted to detonate herself during the al-Qaeda attacks on Jordan a decade ago that killed 60 people, and has been awaiting her death sentence since the subsequent trial. Despite protracted negotiations to release al-Kasasbeh, and two Japanese journalists – who have also been executed – Jordan now believes that the F-16 pilot was killed exactly one month ago, on January 3. Ally United States, which promised "ironclad support" after setting up an emergency meeting between King Abdullah and Vice-President Joe Biden, says experts are now studying the professionally-produced video, to ascertain whether it is authentic, and if so, when it was recorded. Meanwhile, US President Barack Obama has condemned the Islamic State, saying that that the public execution was evidence of “barbarism and viciousness,” and vowing to "banish their hateful ideology to the recesses of history." "Whatever ideology they [IS] is operating off of, it's bankrupt," the US leader told the media, promising to dedicate “all resources” to locating remaining hostages, held by the radical Islamists, who control large swaths of Syria and Iraq. The White House announced that it would raise its budget for aid to Jordan from $660 to $1 billion, to house refugees from nearby conflicts, and to fight off the Islamic State.